Sarita Joshi is working as a Senior Programme Associate with the Integrated Water and Hazard Management (IWHM) programme of ICIMOD. 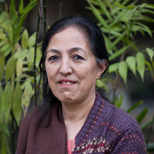 She has been working in ICIMOD since 1986, in different programmes like Mountain Environmental Management (MEM), Mountain Natural Resources (MNR), and Mountain Farming Systems (MFS), among others. She holds a Master’s degree in Geography from the University of North Bengal, West Bengal, India.